TomTom RIDER 2nd Edition is a rugged, water resistant, satellite navigation system designed specifically to fit both motorbikes and scooters and provides clear spoken instructions in your helmet. The TomTom RIDER 2nd Edition is pre-installed with maps for United Kingdom and the Republic of Ireland. Drive mode tailored for simple touch-screen operation with gloves on. Door-to-door planning in your region allows you to find your way to any address in any region/country. TomTom RIDER 2nd Edition motorbike satellite navigation system can also be used on four wheels using the TomTom RIDER Car Mount Kit. TomTom RIDER 2nd Edition has been discontinued. Accessories, spares and parts are still available for your Rider Second Edition. TomTom RIDER 2nd Edition - The biker's navigator. Developed for bikers by bikers. Navigating by bike is different. Which is why TomTom RIDER 2nd Edition has been designed solely with the biker in mind. The TomTom RIDER 2nd Edition features a 3.5-inch with simplified drive-mode instructions on a glove-friendly touchscreen. The TomTom RIDER 2nd Edition is pre-loaded with detailed street-level mapping for United Kingdom and the Republic of Ireland. The TomTom RIDER 2nd Edition also features a rugged design with waterproof finish that handles even the toughest weather. Securely docked on the world’s leading motorcycle mount. TomTom RIDER 2nd Edition comes with RAM mounting hardware that fits almost any bike and a Cardo scala-rider® wireless headset for high quality voice instructions inside your helmet. You've got a choice of 3D or 2D maps on a smooth-scrolling display. The crystal clear, glove-friendly, anti-glare touchscreen even has a sun visor to ensure optimal view at all times. You will receive clear spoken instructions in your preferred language to your destination, but if you decide to take a quick detour, the TomTom RIDER 2nd Edition immediately recalculates and adjusts the route description. Even more flexibility in your route planning: choose the type of route you want - shortest, fastest, avoiding motorways, and more. In addition TomTom RIDER 2nd Edition allows you to find, invite and add friends to your RIDER. Check who's in the area when you're touring, see where friends are right now, even send each other text messages. Instant messaging and smart navigation, all in one. TomTom RIDER has a special low-glare night-display setting which uses colour schemes that are significantly easier on the eye when riding at night. Choose from a range of night view colour schemes. A built-in Bluetooth® receiver in the TomTom RIDER 2nd Edition gives you real-time TomTom PLUS services via the internet connection on your (compatible) Bluetooth® mobile phone, anytime and anywhere. Traffic, weather and road condition reports, scenic routes, detailed city maps, additional voices and POI's (Points Of Interest), and much more. TomTom RIDER 2nd Edition doubles as a hands-free call kit with wireless Bluetooth® technology (with compatible Bluetooth enabled mobile phones) so you can take calls via your touchscreen as you ride. For safety reasons, outgoing calls are blocked while the bike is moving. But when you accept an incoming call, it's automatically routed to your earpiece/pad. And to make a call, just pull over, tap the screen and talk. With your helmet and gloves still on! The TomTom RIDER 2nd Edition also provides you with access to literally thousands of Points of Interest (POI) - petrol stations, parking, restaurants, cash machines and lots more. Cardo Scala Rider headsets are available to pair with your TomTom Rider 2nd Edition. The benefits of buying and using a Scala Rider headset with your TomTom Rider 2nd Edition are three-fold; 1. you can listen to sat nav voice turn-by-turn instructions, 2. listen to music and 3. communicate with other motorcyclists whilst riding (using the intercom when within range and mobile phone when out of range). TomTom RIDER 2nd Edition comes with RAM mounting hardware that fits almost any bike. The totally secure motorbike docking kit attaches the TomTom RIDER 2nd edition with an audible 'click' so you know it's firmly in place. Cardo scala-rider® wireless headset for high quality voice instructions inside your helmet. The optional TomTom RIDER 2nd Edition Car Mounting Kit allows you to use your TomTom RIDER 2nd Edition in your car. To fully enjoy the in-car navigation experience, the car mounting kit has an embedded speaker for spoken instructions. TomTom RIDER works with Tele Atlas Maps to provide detailed maps of the United Kingdom and Republic of Ireland providing 99% coverage. Which in addition to street information include features such as route calculation, Points of Interest, Estimated Time of Arrival, and more. Also available: the TomTom RIDER 2nd Edition Europe - giving detailed street-level mapping for the whole of Western Europe. Map coverage: A, AND, B, CH, D, DK, E, F, FIN, FL, GB, I, IR, L, MC, N, NL, P, RSM, S, SCV. Want to add accessories to your TomTom Rider 2nd Edition model? 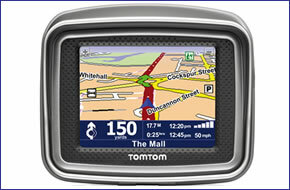 We sell a vast selection of genuine TomTom parts and accessories.